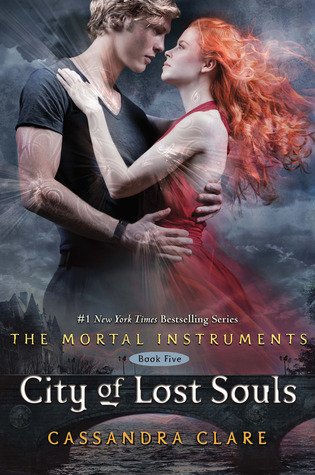 City of Lost Souls picks up two weeks after the closing scene of City of Fallen Angels. Jace is still missing, everyone is worried for him and his safety. The world of Shadowhunters have looking for him but then they decide to scale down their search, much to the dismay of Clary, Isabelle, Simon and Alec. They vow to find Jace without the Clave and, with the help of Magnus, start to find him, but a chance run in with him at The Instiutue by Clary reveals that he isn't the same Jace. He remarkably different and appears to be on Sebastian's side. It's revealed why and the search goes from finding Jace to finding him and getting him back to how he was. If you read my review of the City of Fallen Angels, you'll know the fourth book of The Mortal Instruments was, by far, my least favourite and going in to the fifth book I was a bit apprehensive but I was wrong to be. This book redeemed the series for me. I really enjoyed all of it. I don't want to give too much away because there really is so much I could say about this book. City of Lost Souls returns to the pace of the first three books. It never lags and the story constantly evolves. The characters didn't frustrate me in this one and I was behind every action they took. Well, almost every one, Alec took me by surprise in this installment with the action he contemplated taking with his relationship with Magnus. I never really thought he would even think about it. I know I said before how I loved seeing Clary become a Shadowhunter and you see it even more in this. You see her fighting, see the thoughts she feels when she is and it's clear she's starting to believe it's her destiny to be a Shadowhunter. She still takes risk and I love her for that, without taking the first risk she takes I doubt the others would have got anywhere near to getting to Jace. She's the catalyst for their actions in this book. Which I love, I love how she really becomes a Shadowhunter. With the other characters I enjoyed seeing them working together, trying their hardest to get Jace, the person they all love back, working endlessly to find any way to bring Jace back, unharmed. Willing to push the boundaries are far as they needed to in order to prove that Jace had done no wrong and could be brought back to the boy he was before Sebastian got hold of him. The undercurrent the love stories in this installment were lovely to read. First between Isabelle and Simon; the scene in the room at Magnus' home when she shares her blood with him shows how much they really are meant to be together and how much they love each other. Even if they don't know the other loves them back. Yet, I hope. Then there was Jordan and Maia, who finally found their way back to each other and seemed to fall seamlessly back into the way they used to be so easily. This really was a great installment to the series and I can't wait to read the final installment when it's released next year.